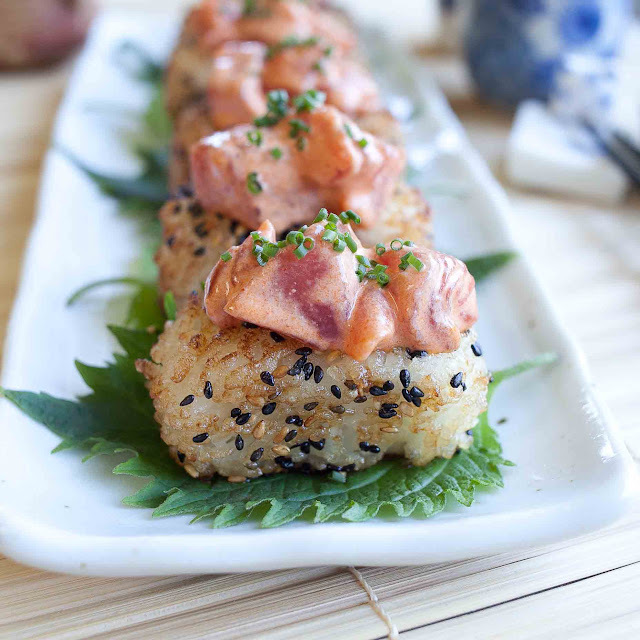 My family loves spicy tuna rolls and I'm sure they'll be excited to try these! I first saw a photo of Spicy Tuna with Crispy Rice on Pinterest--but it took me awhile to find Ravenous Couple's original pin. Their photo is amazing and inspired me to make this sushi. Please click on the link and see for yourself--and take a look at their other amazing dishes and photos while you're there. I used Ravenous Couple's photo and recipe as a tutorial of sorts--trying to get a beautiful photo of my own sushi. My husband came home for lunch just as I was finishing up my photos and quickly ate eleven pieces. He usually doesn't like spicy OR fried food, but he loved these! He raved about the yaki onigiri (crispy rice) and how good it was--crunchy on the outside and soft in the middle. 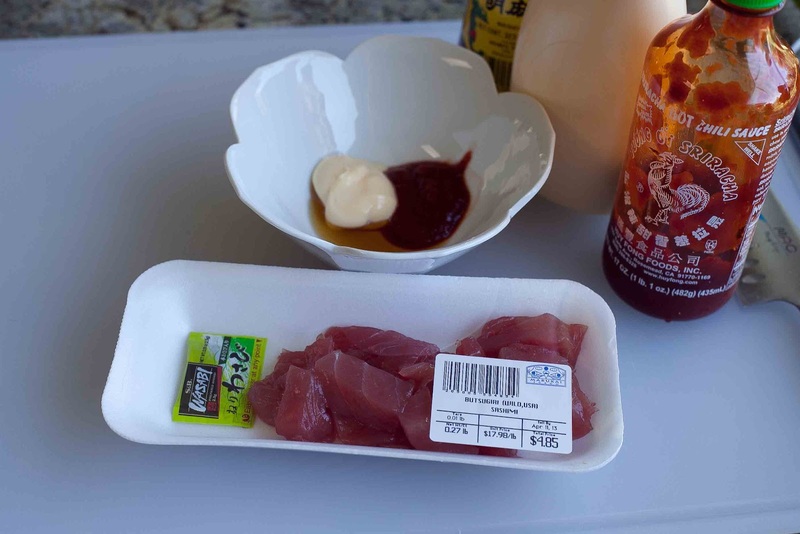 I bought this butsugiri (cut into pieces) wild, USA tuna at Marukai and cut it into smaller chunks. It's a quarter-pound and easily made 15 pieces of sushi with enough left over for 5 more. I don't buy tuna sashimi much anymore, so this is a rare treat. 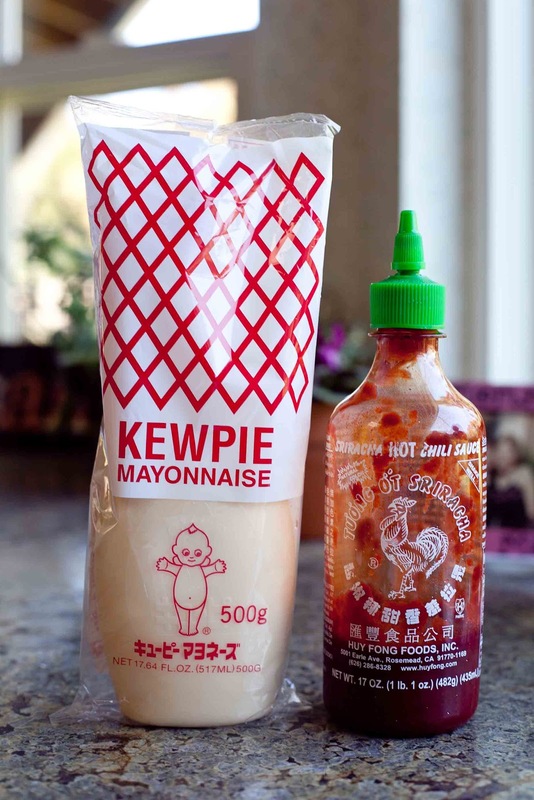 I bought this Kewpie brand mayonnaise--I've always wanted to try it. If you don't have it on hand, use Best Foods. Sriracha hot chili sauce--everyone has that, right? 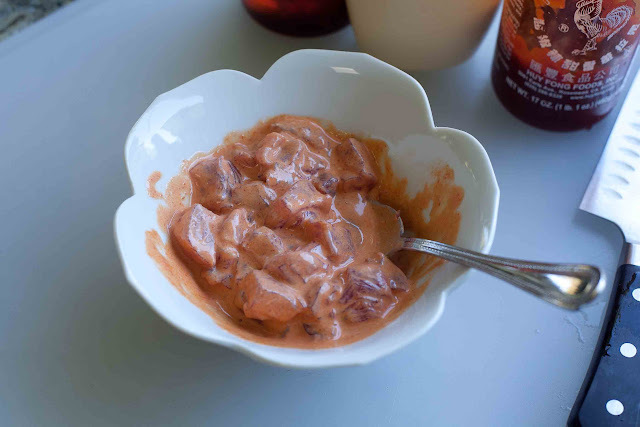 Mix the sashimi with 1 tablespoon each, mayonnaise and Sriracha, plus 1/2 teaspoon sesame oil, cover, and refrigerate. I used only half the amount of tuna recommended in the recipe with the full amount of sauce and was worried it would be too hot--but apparently it wasn't. After eating all the sushi, Gary calmly said, "My mouth is burning." Calmly, not frantically--so I'm assuming it was a good kind of hot. I just realized my readers may need a primer on making sushi rice. It's simple to use the instant sushi seasoning as I did in my Homestyle Sushi Bar post, but this time I used the vinegar, sugar and salt mixture. 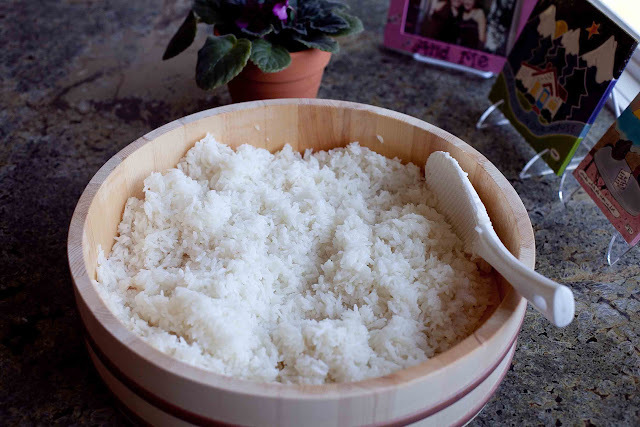 You can find a good sushi rice primer on La Fuji Mama's Sushi Rice, the Secret Behind Delicious Sushi post if you haven't made sushi rice. After the rice has cooled, make the onigiri using a plastic mold you can find at an Asian market. I was taught the proper way to make onigiri is to compact the rice loosely, but this time, since the onigiri will be fried, pack the rice in a little more firmly so it won't fall apart while frying. After making the onigiri, I brushed a small amount of Red Shell's teriyaki sauce, which I always have on hand since my neighbor is Hiro Watanabe, owner of Red Shell Foods. You can use plain shoyu too. Then, I dipped the onigiri in the goma (sesame seeds). The three on the left, I rolled in the sesame seeds, and the others I put the sesame seeds on my fingers and pressed them onto the onigiri. I liked that better. Then I took the onigiri outside to fry them with a butane stove I use for shabu shabu. 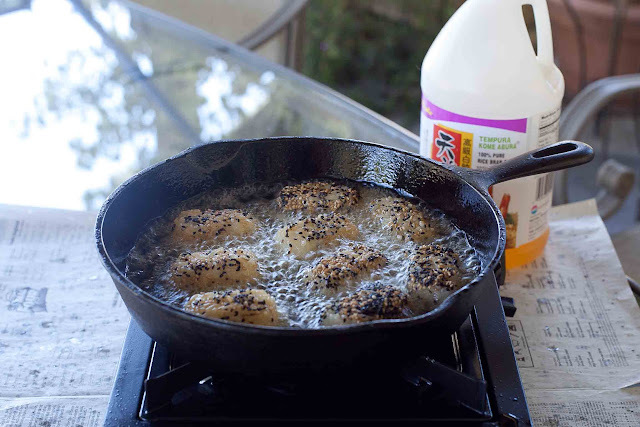 I like to fry foods outside, that way the whole house doesn't smell like oil. One day, I will have to break down and buy the enclosed fryer that the Ravenous Couple used in their post. Fry the onigiri and drain well. Note: Be sure to use a splatter screen--the oil will pop! 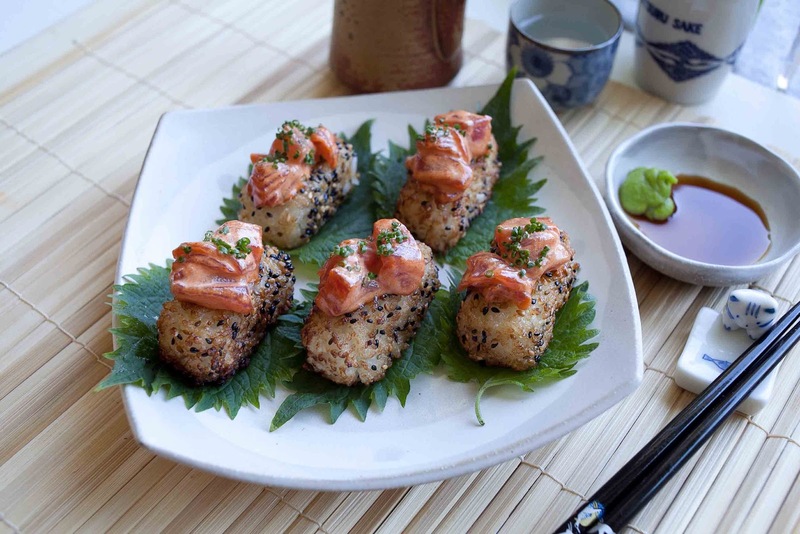 Top the yaki onigiri with spicy tuna chunks, top with chopped chives, green onions, or chopped/sliced jalapeños. 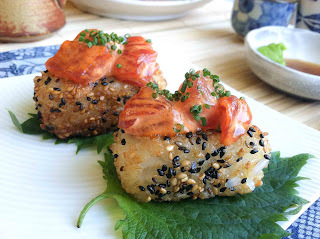 Garnish with shiso leaves. This is my daughter's birthday week. Happy Birthday to a wonderful daughter who keeps us all close even though she lives far away. It's fun looking at all these photos and with each one comes a flood of memories. You may remember her from other posts, she actually started out planning on posting regularly here on FOODjimoto.com, but became too busy with motherhood and work. You may remember her Chicken and Dumpling Soup. It's Karen & Mitchell's wedding anniversary soon, too. Wedding photos by Lauren Miyake Photography. 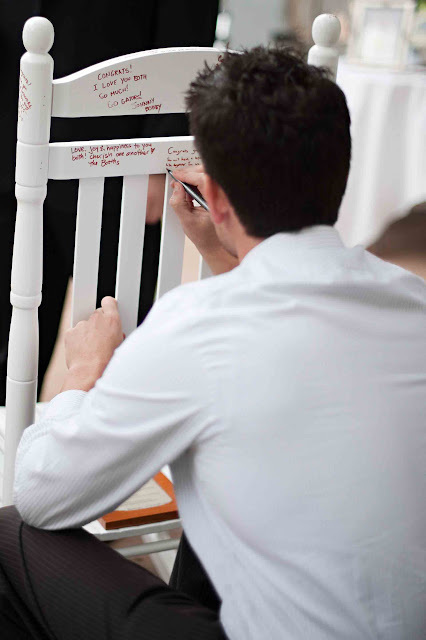 Use a spray varnish to seal the signatures, so they won't rub off. 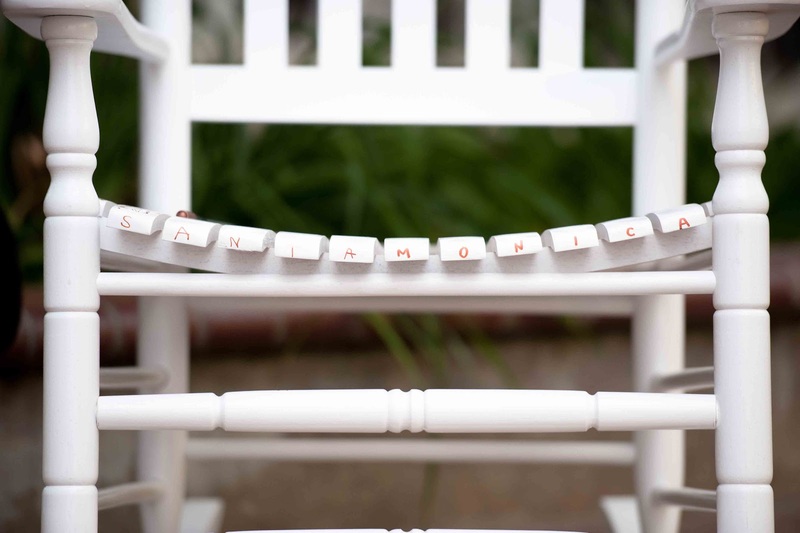 A clever adding of Santa Monica on the chair seat! A Someday Chair is a great do-it-yourself item for a wedding reception. 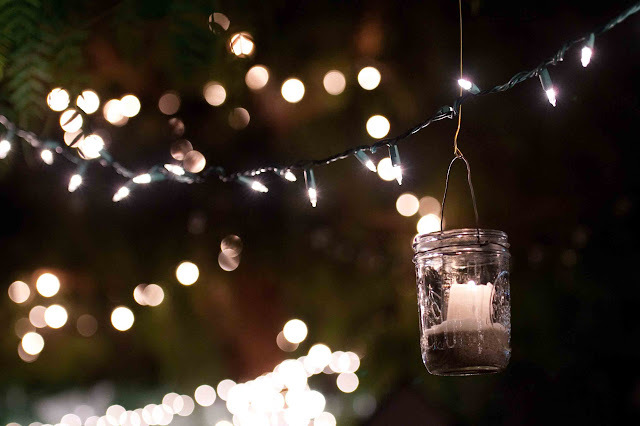 I loved these candles in a mason jar, too. I thought these wedding ideas would be good to share since summer wedding are coming and there a lot of do-it-yourselfers out there. 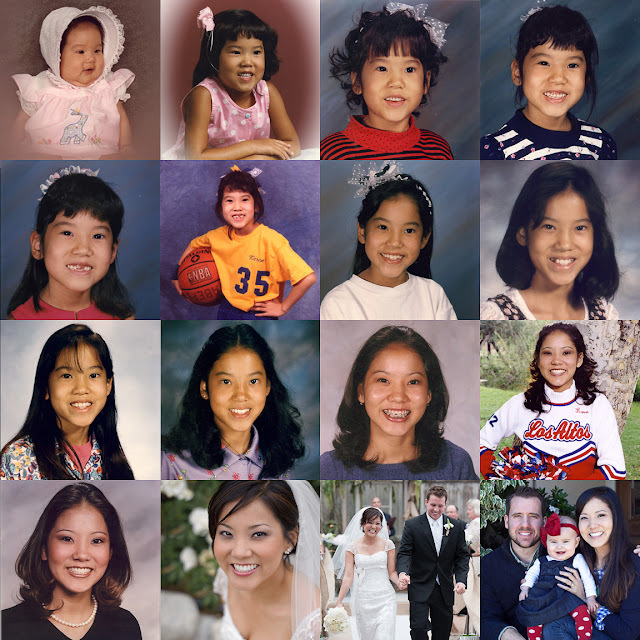 Happy Birthday and Happy Anniversary, Karen! 1. Wash and cook rice. When rice is done and has steamed for 15 minutes, season with sushi powder or su while hot. 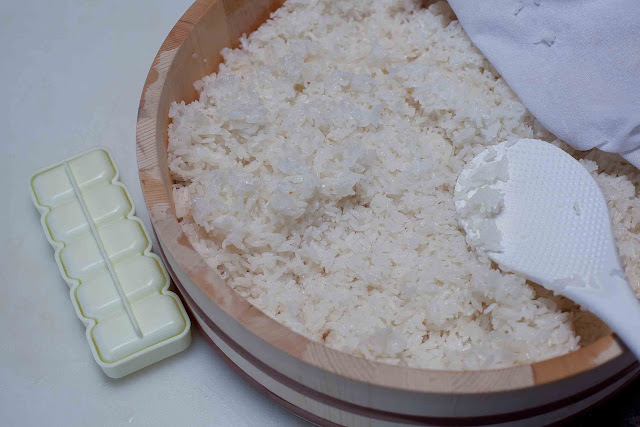 Start with half the amount of su, sprinkle on hot rice and cut and fold rice with shamoji or paddle. Fan rice while adding vinegar mixture. Season rice to taste. When cooled, set aside covered with damp towel. 2. Cut up tuna and mix with mayonnaise, Sriracha and sesame oil. Cover and refrigerate until ready to use. 3. 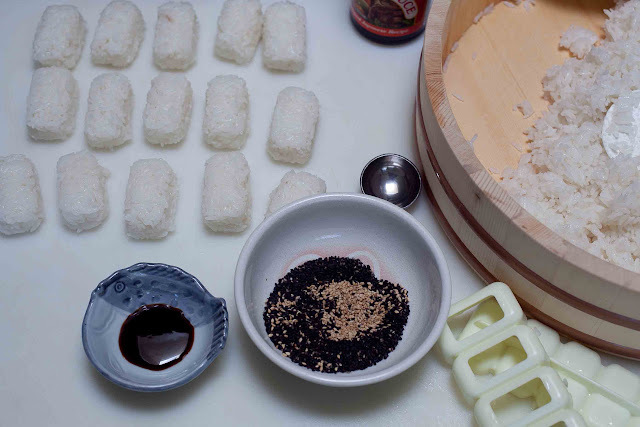 Form rice into nigiri using a rectangular mold or by hand. Press rice firmly into mold. 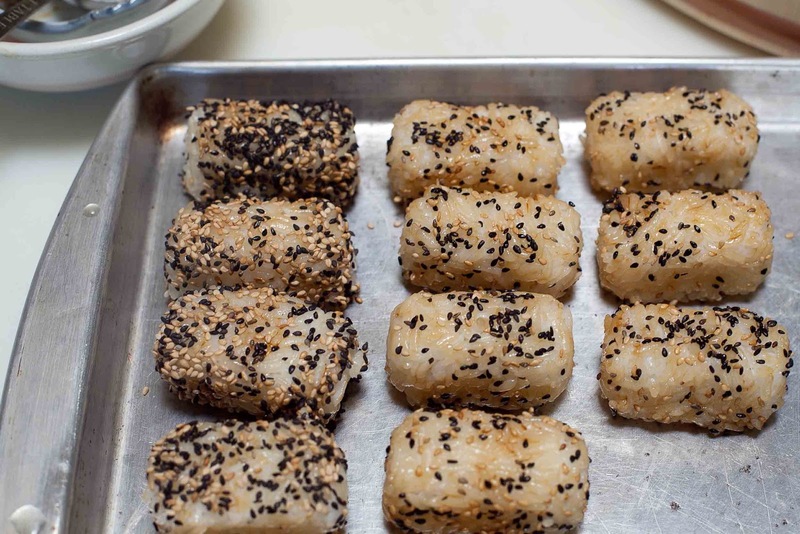 Season with a small amount of shoyu or teriyaki sauce and press sesame seeds onto rice or roll in thinly spread sesame seeds on a plate. 4. Fry nigiri until crisp, drain well on paper towels. 5. 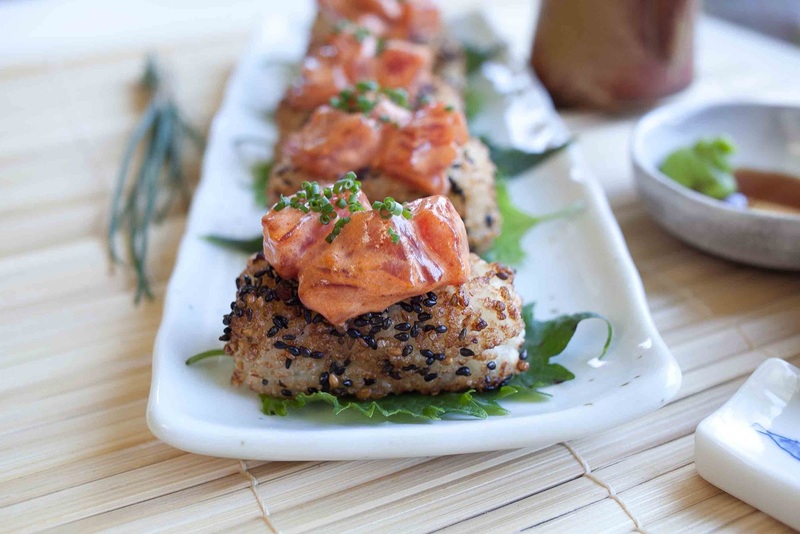 Top with spicy tuna mixture and garnish with chopped chives, green onions, or jalapeños. 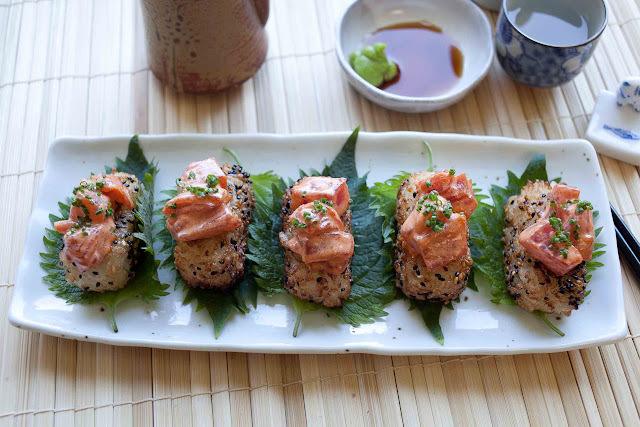 Garnish with shiso leaves optional. Wow, that looks amazing! I bet my husband would love it too. 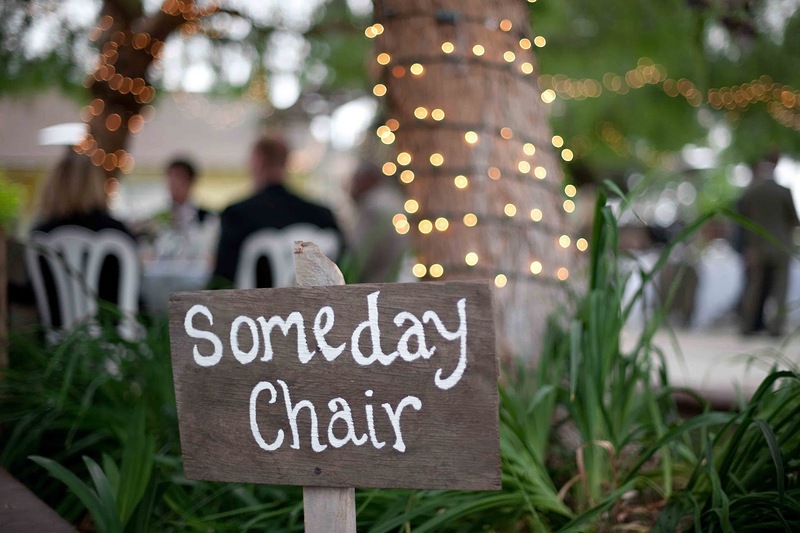 Love the someday rocking chair--something to use and enjoy right away too.